Howlite is a semi-precious Stone that is mostly known for its likeness with other stones, and more particularly with turquoise. Its name comes from the Canadian chemist who discovered it in New Scotland in 1868, Henri How. It can be found under the names of white turquoise, howelite, khaulite, silicoborocalcite, winkworthite or turquenite. It is a hydroxylated calcium borosilicate. 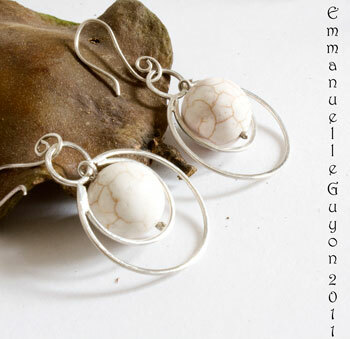 Howlite is a grey or white color stone which looks a lot like porcelain. It shows some black or dark veins. It is a porous and soft stone. Because it is a porous stone, it can be easily dyed to imitate other stones. It is often sold as turquoise (dyed in blue), coral (dyed in red) or as lapis lazuli. American Indians would call it "the buffalo sacred stone" or the "white buffalo stone" because it was as rare as was the white buffalo. Mines: Canada, the USA, Turkey, Germany, Mexico, Russia. Howlite would help with memory. It would help to balance calcium in the body. Howlite would work with teeth and bones problems. It would help with insomnia when placed under the pillow.